A list of organisations which supported the project. ‘Sand House – The Elephant in the Room’ was a project supported using public funding by the National Lottery through Arts Council England and ran from 23 April until 29 June 2012. It was based at The Point, 16 South Parade, Doncaster, DN1 2DR. The closing date was extended from 15 June so that the exhibition could still be on display when the Olympic Torch Relay passed The Point on 26 June. 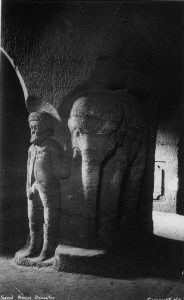 The project included several key elements, the most striking of which was the creation of a full-sized replica of the original ‘Elephant & Mahout’ carving from the Sand House tunnels, carved from compacted sand. The exhibition attracted over 4000 visitors during its 10-week run, with an average of one visitor every 5 minutes! You can read the final evaluation report for the project by clicking here. (Please note that financial information has been removed from this version). You can watch an updated version of the documentary film about ‘Sand House – The Elephant in the Room’, produced by Finn Varney of Aberration Films, by clicking the arrow button on the image below, left. The original film was shown at the exhibition itself at The Point. Another short video was created (not by Aberration Films) to show the sand sculptures being dismantled and removed from the Gallery on 30 June and 1 July 2012. This short film, entitled ‘The Elephant Leaves the Room’ can be seen below, right.. 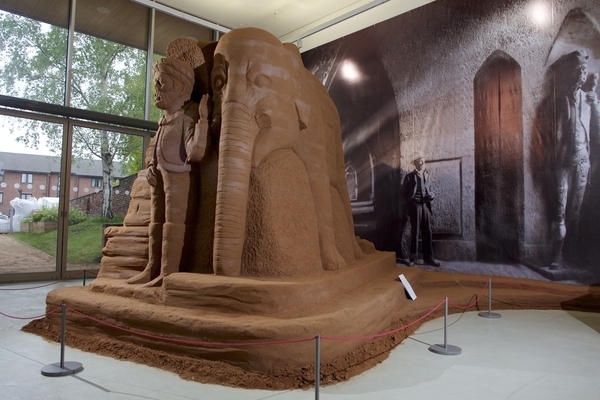 The centrepiece of the exhibition was a 35-tonne sand sculpture of the ‘Elephant & Mahout’, but there were also several other, smaller sand sculptures, inspired by the Sand House. In addition, there were story boards giving an insight into the history of this unique feature of Doncaster’s past, a 19-minute documentary film by Aberration Films about the making of the exhibition and a time-lapse video showing the ‘Elephant & Mahout’ being carved. A gallery of photographs taken during the exhibition is available on the Gallery of Exhibition sub-page. That sub-page also gives details of how to obtain digital copies. The artistic director for the exhibition was Jamie Wardley of Sandinyoureye. He is one of the UK’s leading sand and ice sculptors. In parallel with carving the ‘Elephant and Mahout’, Jamie ran a 5-day training course for enthusiastic artists, amateur or professional, who wished to learn sand carving skills. By the end of the course each trainee had created their own sand carving, inspired by the Sand House. These carvings were displayed throughout the exhibition. Jamie Wardley and Sandinyoureye ran several half-day workshops in sand carving for pre-booked school groups and a day of one-hour sessions for families. Everyone who took part had a great time and the feedback was excellent. The sand that was used for the Workshops has been transferred to a new site, where it can continue to be used for similar activities for years to come. There were 3 days of stone-carving demonstrations held at Doncaster Minster and provided by the West Riding Stonecarving Association. The demonstrations showcased the skills that were used in creating the original sculptures at the Sand House. On Thursday 31 May an Oral History Day was held, when people with their own memories of the Sand House and its tunnels came along to chat about what they remember. Their recollections were audio-recorded and will serve as a lasting record of this important part of Doncaster’s heritage. Richard Bell, co-author of ‘The Sand House – A Victorian Marvel Revisited’, gave one of his much-praised illustrated talks on the subject, during the project, attracting over 50 people. If you are interested in obtaining more information about the project, please contact us.